Sustainable City pLAn, drought response, climate action, and other timely sustainability issues. The NCSA board is composed of stakeholders from Neighborhood Councils across the City of Los Angeles. The NCSA is affiliated with Social and Environmental Entrepreneurs (SEE), a non-profit public charity exempt from federal income tax under Section 501(c)(3) of the Internal Revenue Code. 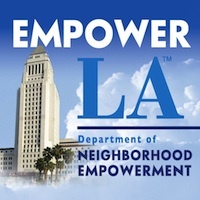 Please direct inquiries to: NCSA@empowerla.org. combustion will be a critical step toward remedying this persistent problem. part of a sustainable water strategy for Los Angeles. same investments in coal, oil and gas. scenarios they have investigated that increased costs, if any, might average $5/month per household. Angeles can assure its position as a national and international frontrunner in advancing clean energy.